Like Ugandans, most Namibian cyclists also rely on affordable, refurbished second-hand bicycles, donated by international agencies and distributed via local organisations. Michael Linke, from the Bicycling Empowerment Network of Namibia, describes an HIV/AIDS support group in Walvis Bay, which runs a Bicycle Empowerment Centre - the Welwitschia Bicycle Shop - and uses the profits to support members with small enterprise funding. Ester Ndenju is a member, and her profit share has enabled her to a stock of various household necessities for her modest tuck-shop. "This small capital injection has meant a great deal to Ester," says Linke, "whose customers are no longer frustrated by her empty shelves, and who is better able to support her family from the increased profits." 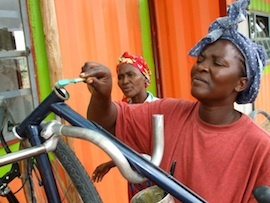 Bicycles save lives in Zambia (through the implementation of bicycle organisation Zambikes’ innovative "zambulance" trailer project), and save money in South Africa (and everywhere else, of course.) Dustin McBride, who runs Zambikes in Lusaka, Zambulances, says these bicycle trailers with a mattress and privacy curtain save one life for every nine days in which they are used. The Bicycling Empowerment Network of Namibia, which facilitates importation in that country, has implemented 25 local distribution stores across the country, known as Bicycling Empowerment Centres (BECs). Conceptualised by Michael Linke and Clarisse Cunha-Linke, BENN has now imported almost 20,000 bicycles, and is able to tell multiple stories of how bicycles have changed the lives of the recipients for the better. Before the advent of the BEC network (advancing steadily since 2006), there were only two reasonably well-stocked bicycle shops in Namibia, says Michael Linke. Of course this made cycling, and its associated benefits, somewhat inaccessible. Linke tells the story of Isabella Thipungu, who lives in her family’s village, eight kilometres from the town of Divundu in Namibia’s Kavango region. Because of the distance, she used to live in the school hostel in Divundu, and only saw her family on weekends. Since she bought a bike at Makveto Bicycle shop, a BEC near her home, she has moved back to her family home and commutes every day in a fraction of the time it would take to walk. Before Makveto started, Isabella’s nearest bike shop was 250 km away, says Linke. There’s no doubt that for utility cyclists in much of Africa (people who cycle as a means of transport), cycling is not a step backward but a step forward. And as Gil Penalosa, international liveable cities consultant, points out, Copenhagen and Amsterdam are among the wealthiest cities in the world, and they have the highest urban cycling rates. In these cities, bicycle transport has neither “loser” nor “elite” status; it’s simply the cheapest and most convenient way in which to get around. Similar success stories can be found in Malawi, Zambia, Ghana, Kenya, Tanzania, Botswana and Zimbabwe: bicycles have an immediate cost-saving, life-enhancing and poverty-reducing impact on the lives of everyone who rides them. There are also shared challenges. The roads are dangerous, authorities don’t take the needs of bicycle commuters into account, and new bicycles are priced beyond the pocket of those who need them. His words fell on receptive ears – those of bicycle component manufacturing giant Shimano, at the conference in search of new markets in Africa. And so it was that March 2011 saw the launch of the African Agenda for Bicycles, a task team of civil society organisations and individuals from more than 15 sub-Saharan countries, and Shimano, with one goal: to reduce the price of new bicycles in Africa. This they plan to do by advocating the slashing of import duties and taxes on bicycle components, and by setting up local bicycle assembly plants.